Jeremy P. White, managing attorney at the Lynchburg office of the Virginia Legal Aid Society (VLAS), is the recipient of the Virginia State Bar Legal Aid Award presented by the Special Committee on Access to Legal Services. White was nominated by David Neumeyer, VLAS executive director, who praised him as “an innovative, creative and successful advocate, an experienced and excellent supervisor and office leader, and as a litigator and trainer who has impact far beyond the VLAS service area.” White graduated from MidAmerica Nazarene College in Olathe, Kansas, in 1998, and from the Washington and Lee University School of Law in 2002. 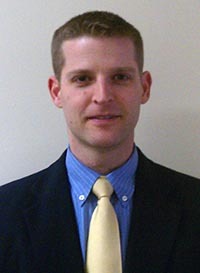 He joined VLAS as a staff attorney in Emporia in August 2002 and became the managing attorney in Lynchburg in 2005. Since 2006, White filed eleven affirmative federal court cases for violations of federal consumer law and achieved recoveries or satisfactory settlements for his client in every case that has been concluded. He served as co-counsel in Danville Circuit Court against a payday lender who violated state law by repeatedly flipping loan’s to keep the client in a long-term cycle of debt. In 2013, White filed suit in Campbell County Circuit Court that resulted in a settlement of $19,500 in recovery and fees against a pawn shop, the owner of the pawn shop, and the repo man for violating usury laws, the Uniform Commercial Code, the Virginia Consumer Protection Act, and the Fair Debt Collection Practices Act. White received an arbitration award in 2012 against a car title lender in a case he co-counseled. The client was awarded $25,000 in recovery for the usurious open-end loan that unlawfully imposed triple digit interest. White successfully appealed an adverse Virginia Employment decision, Williamson v. Virginia Employment Commission, in which the employer sought to shift liability to its employees for accidents or wrecks that occurred in company vehicles. Finally, during the 2014 General Assembly session, White’s work with the VLAS Consumer Practice Group assisted lawyers with the Virginia Poverty Law Center obtain a repeal of the Virginia Code section that permitted owners of rent-to-own furniture stores to criminally charge customers who fell behind on their payments. The Legal Aid Award recognizes lawyers employed by legal aid societies licensed by the VSB. Recipients are chosen for their advocacy, quality of service, and impact beyond their service area. It will be presented June 19 at the Virginia State Bar Annual Meeting in Virginia Beach.